Toronto, Ontario--(Newsfile Corp. - August 21, 2018) - Palamina Corp. (TSXV: PA) reports that New-Sense Geophysics Limited has commenced a 3,083 line kilometer heliborne geophysical survey over its Coasa, Gaban and Cori gold projects in the Puno Orogenic Gold Belt ("POGB") in south-eastern Peru. In the POGB, gold mineralization frequently has an association with magnetic pyrrhotite within swarms of orogenic quartz veins and veinlets restricted to discrete, continuous packages in shear zone structures hosted by fine-grained sedimentary units. Palamina believes results from the heliborne survey will outline regional structures and help focus follow up ground exploration on identifying the most prospective sectors for possible drill testing. 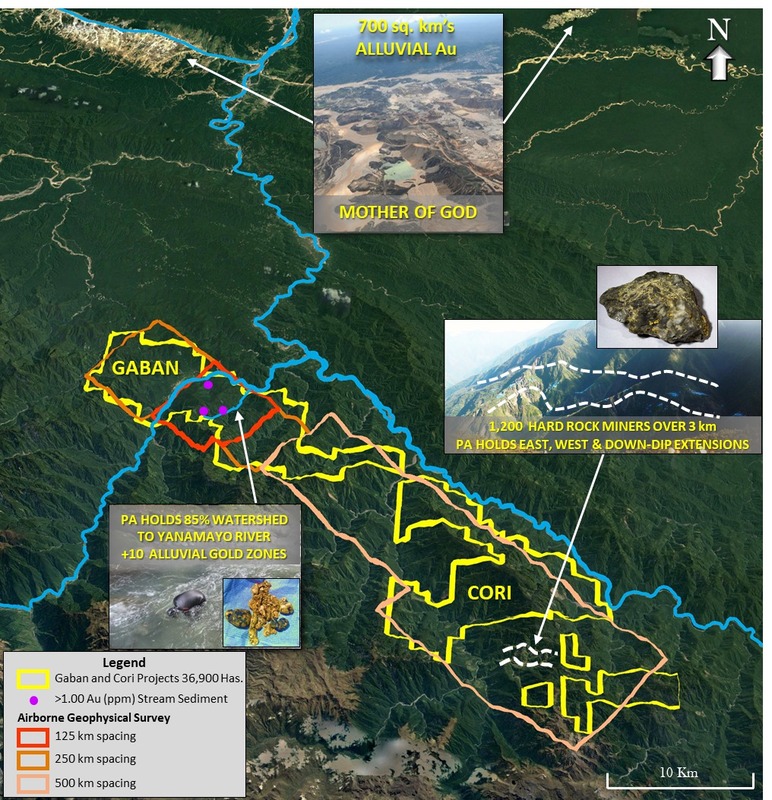 Andrew Thomson, President of Palamina stated, "The heliborne geophysical surveys should rapidly advance our understanding of the structural and geological attributes of the Gaban, Coasa and Cori gold projects. Palamina is the first company to conduct airborne geophysics over these areas and continues to advance its understanding of the structures in the POGB. Given the success to date of our mapping and prospecting efforts we believe this additional information will accelerate our pace of discovery." At Coasa, the heliborne geophysical survey will target the extension of the regional shear-zone hosting GoldMining's Crucero gold deposit and the recent gold discoveries by the Company along the projection of the same structure near Phusca. The survey will also look to expand on the recently identified Veta Zone discoveries where gold values up to 39.2 g/t gold and 7 m of 4.2 g/t gold were returned from chip sampling (see July 5, 2018 NR21). The Gaban & Cori Gold Projects cover 36,900 hectares where the heliborne geophysical survey will provide Palamina the first modern regional airborne dataset over an orogenic corridor which is currently the focus of both informal placer and hard rock gold mining activity. This section of the POGB sits at the apex of the San Gaban and Inambari rivers, feed from which contributes to the 700 square km's of alluvial gold being mined from the "Mother of God" region in the Amazon jungle. At Gaban, 10 sets of alluvial miners intermittently mine coarse gold from the Yanamayo river where Palamina has acquired the mining rights to 85% of the surrounding ridges believed to host the orogenic source of the alluvial gold. Through jungle cover the airborne magnetic survey will be key in locating extensions to structural shear zones hosting the source to this gold mineralization. 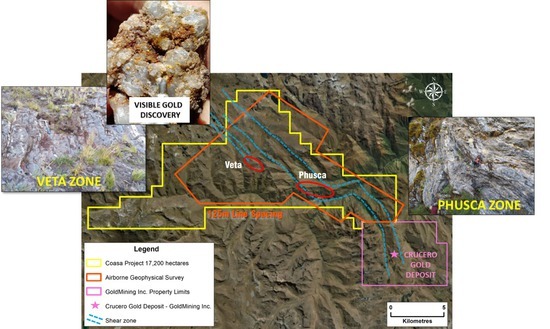 At Cori aeromagnetic flight-lines were selected to detect possible extensions and structural targets parallel to a known 3 km long NW-SE gold-mineralized trend on the southwest side of the Corimayo mountains. Over 1,200 informal miners are mining native orogenic gold from quartz veins in at least 7 separate mining camps within the trend. Palamina has staked available extensions of this structure in both directions as well as the down-dip extensions on the north side of the Corimayo mountains. The three programmed heliborne geophysical surveys are being flown at a constant terrain clearance altitude of approximately 40 metres measuring magnetic and radiometric data. Survey flight lines will total approximately 3,083 line-kilometres and be flown approximately perpendicular to the dominant structural trends and depending on Palamina objectives, on parallel line-spacing's of 125 metre, 250 metre and 500 metre intervals. Magnetic and radiometric data will be downloaded at frequent intervals so that target identification can commence immediately, rather than on completion of the survey. Palamina has secured 5 gold projects in south-eastern Peru in the POGB based on the undertakings of an exploration team having a cumulative 35 years' experience in the POGB. The POGB is one of the world's least formally explored orogenic gold belts. Palamina's five district scale gold projects now cover 78,500 hectares in the POGB. All have previously been to some extent "ground-truthed" by artisanal, small-scale and informal miners who are generally limited to mining gold from the top 50—100 metres below surface. Mineralized orogenic systems can extend down dip to over 1,000 metres in depth. Palamina continues to drive shareholder value through discovery. This news release contains certain "forward-looking statements" within the meaning of such statements under applicable securities law. Forward-looking statements are frequently characterized by words such as "plan", "continue", "expect", "project", "intend", "believe", "anticipate", "estimate", "may", "will", "potential", "proposed" and other similar words, or statements that certain events or conditions "may" or "will" occur. These statements are only predictions. Various assumptions were used in drawing the conclusions or making the projections contained in the forward-looking statements throughout this news release. Forward-looking statements include, but are not limited to, the use of proceeds of the Offering and the Company's future business plans. Forward-looking statements are based on the opinions and estimates of management at the date the statements are made, and are subject to a variety of risks and uncertainties and other factors that could cause actual events or results to differ materially from those projected in the forward-looking statements. The Company is under no obligation, and expressly disclaims any intention or obligation, to update or revise any forward-looking statements, whether as a result of new information, future events or otherwise, except as expressly required by applicable law. A more complete discussion of the risks and uncertainties facing the Company appears in the Company's continuous disclosure filings, which are available at www.sedar.com. Neither the TSX Venture Exchange nor its Regulation Services Provider (as that term is defined in the policies of the TSX Venture Exchange) accepts responsibility for the adequacy or accuracy of this release.